This SMD FM transmitter has an operating frequency of about 80 to 115MHz. Under reasonable circumstances you will be able to receive its signal at a distance of about 200 meters. Very strong FM transmitter. You maybe need license to run this. A amplifier of force RF for the FM, is always essential for the amateur that wants it strengthens some small transmitter, that likely already it has manufactured or has been supplied ready. The circuit is in two halfs, an audio amplifier and an RF oscillator. This small transmitter uses a hartley type oscillator. Normally the capacitor in the tank circuit would connect at the base of the transistor, but at VHF the base emitter capacitance of the transistor acts as a short circuit, so in effect, it still is. This circuit is a 73 MHz Hallogene Lamp Radio-Controlled. The purpose of it is to control the power state of a hallogene lamp by a remote control. This circuit is designed to work at UHF frequencies in the range 450-800MHz. It has a gain of around 10dB and is suitable for boosting weak TV signals. An AM portable radio receiver made from the ZN414 IC. The ZN414 ic has now been replaced by the MK484 which is identical in performance and pinout. 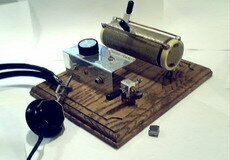 The input can be from a longwire or a loop antenna. The unit covers MW and Sw to 30MHz. This is a compact three transistor, regenerative receiver with fixed feedback. It is similar in principle to the ZN414 radio IC which is now replaced by the MK484. This circuit may be tuned to operate over the range 87-108MHz with a range of 20 or 30 metres. A VHF band TV transmitter using negative sound modulation and PAL video modulation. This is suitable for countries using TV systems B and G.
Simple radio with operational amplifier circuit diagram.